It has emerged that just an hour before the Green Brigade march in Glasgow on Saturday, a political protest group openly defied direct police orders to hold a demonstration – without a single resulting arrest. Unite Against Fascism (UAF) held a counter-demonstration to a planned display by the Scottish Defence League (SDL) to mark the anniversary of the death of Kriss Donald, who was murdered in 2004 by an asian gang. Despite making no formal request to hold a demonstration or alert police, an organiser had a letter delivered to him by hand, signed by acting Chief Constable Campbell Corrigan of Strathclyde police, three days before the event, warning the organisers not to proceed in their intended area in Pollokshields. The group openly defied the orders but none of those attending – around 200 people, including a Glasgow city councillor and community organisers – were arrested. One man who attended the event described the police’s handling of the event as “commendable”, with no trouble ensuing. A short time later, police officers made their way across the city after hearing reports of a march to the football game between Celtic and Aberdeen, organised by Celtic fan group the Green Brigade, to raise awareness of Scottish government legislation they say criminalises football fans. At the march, again with around 200 people in attendance, 13 people were arrested for alleged public order offences. Strathclyde police cited that the marchers had been an “attempting to stage an illegal street procession”. Marchers were kettled by 200 police officers, who the police service confirmed had originally been deployed to cover other events in the city, and the footage of events has led to calls from members of the public and Glasgow politicians for an inquiry into the police’s handling of the situation. 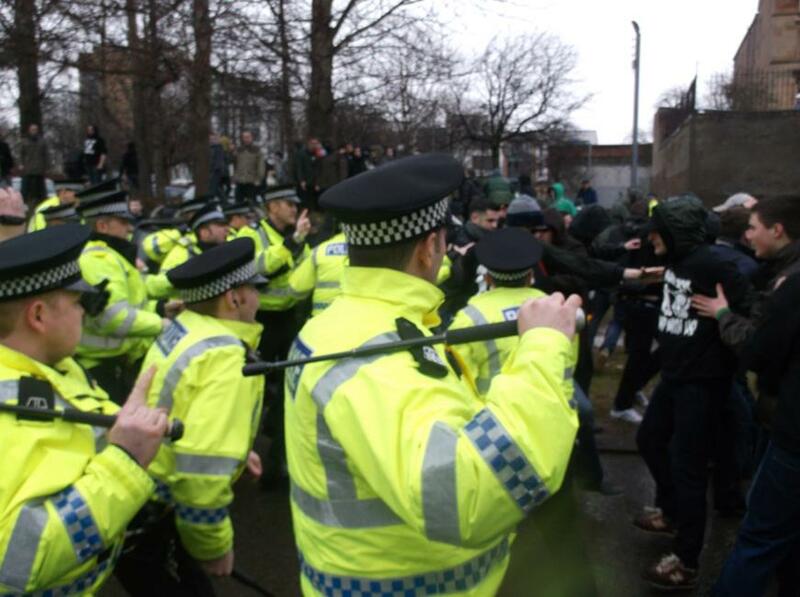 While police claim the Green Brigade event was an attempt to stage an illegal street procession, it is unclear why events a short time before, policed by the same officers, in direct defiance of police orders and without permission, was handled differently. In the three-page letter delivered to UAF organisers, Campbell Corrigan made clear that the police considered any demonstration by the UAF in Pollokshields to be a threat to public order, and instructed that it be held at Glasgow’s St Enoch Square: “I reasonably believe that the intended public assembly which you are organising may result in serious public disorder, or serious disruption to the life of the community and, to that end, give this direction imposing the following conditions in terms of Section 14 (2) (b) of the Public Order Act 1986. “You should be aware that it is an offence for someone organising a public assembly to knowingly fail to comply with the condition imposed in accordance with Section 14 of the 1986 Act. The source who brought the letter to my attention told me he considered the behaviour of the police “draconian” and said the organisers continued as planned with their demonstration, openly defying direct and clearly laid out orders from Strathclyde police, without arrest or disruption to public order. The demonstration was considered high risk by Strathclyde police because two opposing political groups were scheduled to hold their events at the same time over a sensitive issue in the community. Both groups were contacted by the police force in advance of the planned demonstrations. Across the city at the Gallowgate, football fans began gathering to march to Celtic Park, with a heavy police presence quickly arriving. Strathclyde police said approximately 200 officers attended, some on horseback. Around 20 police vans surrounded the marchers, with a police helicopter hovering above. Witnesses at the event described seeing police wielding batons – claims corroborated by mobile phone footage taken by several onlookers and posted online. A police statement said 13 arrests were made for alleged public order offences and that some in the crowd “were wearing similar hooded tops and using scarfs to hide their identities”. The police statement went on to say the marchers had become confrontational and aggressive, although the claims have been disputed by those in attendance. Police didn’t JUST find out about the walk to the stadium up the road from the GB, they knew well in advance as it was public knowledge for a week before the event. Good on the cops, they knew from previous experience just what a nasty bunch like the GB are capable of. Has anyone been out in the cold the last couple of days?